with a linkup at the end of the month to report progress. Learn more about OMG here. So in January my goal was to finish the yellow and gray Exploding Pineapple (which I have now named "Pineapple Inside Out" thanks to Gayle at Mangofeet), to include pieceing the back. Well, I got the top finished in January, but fell short on the back. I may be a month late, but I was able to locate the second piece of fabric needed for the back. Four cornerstone/log cabin blocks ... and all they need is the last two blue logs. Two more days, just TWO more days! With a simple border it will be a nice queen size. So once again I'm a month late and a couple of days short. Reporting in with Heidi at Red Letter Quilts. I actually like brown. I have some beautiful browns in my stash. But the Rainbow Scrap Challenge, in my mind anyway, is to encourage using up scraps. Turns out my brown scraps are just that -- (s)crap. My intention was (still is) to finish Smith Mountain Morning this month. However, I discovered that my use of brown scraps in the cornerstone/log cabin blocks yielded some really unattractive blocks (think baby poop). No, I'm not going to ditch what I've done; I'm just having a hard time getting excited about finishing it. Even these lack character, but I think they will be neutralized when they are grouped with some earlier brown string blocks. My sewing room/studio had become such a shambles that I am embarrassed to show a "before" photo, so this week I decided I had to clear out a pile every day before I could sit at the sewing machine. In the process I came across some Wink & a Smile blocks. Coincidentally they were mostly brown (or shades thereof) so I thought I could substitute them for my OMG (One Monthly Goal). Turns out I didn't have enough of the (really weird) background fabric to complete the full quilt as planned -- probably why it wasn't finished -- so I decided to make two smaller quilts. This involved a lot of reconstruction in order to balance the background fabrics (more on that later) and this is where I currently stand. I'm linking up with Angela at So Scrappy. Let me tell you, six straight days of sewing can be exhausting! So it's taken me a couple of days to get back to reality as well as catch up on things like laundry and meal plans. 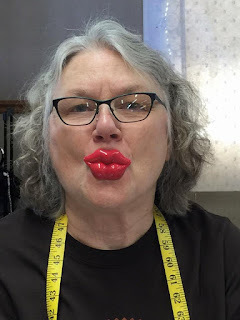 Last Friday I moved from the Nuts and Bolts retreat at Camp Loucon in Kentucky to the first annual Music City Modern Quilters Guild retreat at Paris Landing State Park in Tennessee. The sewing room was great -- well lit with large windows overlooking Kentucky Lake (it's on the Tennessee River but the dam is in Kentucky). We couldn't have asked for better weather, either. Quite a change from when I left home in freezing rain the previous Monday. All the cabins had great views of the lake, as well. We were all greeted with this mug and a goody bag of treats. I brought quilting chicks for each machine. Stephanie at Cotton Bliss had a pop-up shop to fill our every need. I took advantage of her great price on Aurifil thread! I wish I were still as limber as Melissa! Melissa at the cutting "table"
Lots of interesting projects, several flimsy finishes and two completed quilts (she came with tops done). Actually, I accomplished much more than that. I got all the remaining flying geese units made and sewn into strips of five -- can't remember how many new blocks I was working on. The rest of the time I was selecting the fifteen 2-1/2" squares to go with the geese. I am trying to grade the value light to dark from the top down and from right to left in the squares. This block does it better than some. I have kitted up all but about three blocks. Once they are finished I can set the final layout. BTW, if you read my last post, I found the already-finished blocks at home in the box with all the Japanese taupe fabrics sitting next to my cutting table. All-in-all, a very successful first retreat. We are all looking forward to the next one. This week at Camp Loucon has been a blast! The trip up on Monday was a bit iffy -- pouring rain till I hit the Kentucky state line, then the snow on the roadside got deeper and deeper as I went north. But the only real hazard for me was a deer that slipped on the interstate right in front of my van. Somehow she got up and out of the way, however one of her entourage on the other side of the highway was not so fortunate. I had great plans to complete Smith Mountain Morning and I did make quite a bit of headway. But those dang cornerstone/log cabin blocks took forever! Plus I didn't have a great assortment of colors as I got closer to the end. So this is all I can show for 2-1/2 days of effort. I finished as many blocks as I had pieces for and made notes on what still needs to be done. As I don't plan to do the pieced border I should be able to finish the flimsy by the end of February. Lots of Rainbow Scrap Challenge brown pieces have gone into this one! Thursday morning I set out to finally get the borders on my Classic 4-Patch. I had screwed up cutting the border fabric back in August, but lucked into more on a half-price table in September. I am delighted to declare this top DONE! I spent the remainder of the day cutting a project I may find myself working on at the next stop in my itinerary. You see, I apparently left the finished half of my planned project at home and I will be progressing directly from one retreat to another with no way to stop by the house and pick it up. So Friday morning I'll be heading over to Paris Landing State Park in Tennessee. It's near the town of Paris which has a replica Eiffel Tower. We're hoping for a photo op! Now that these 4 days are nearing an end, I find myself plum puckered out! More from Paris ... Landing soon. Quite a few years ago a group of quilters from Kentucky and Tennessee met in the middle at Kentucky Dam State Park for a weekend retreat. I'll be heading out to the hinterlands today, weather permitting, for a different retreat in the middle, but still a meeting of Kentucky and Tennessee quilters at a Methodist Retreat Center north of Bowling Green. And, yes, the fastest route takes me past Whittle's .... good thing I don't need anything 'cause I might decide to take the parkways to avoid some icy conditions. As if four days of fun and frivolity isn't enough, on Friday I'll head over to Paris Landing State Park for a weekend retreat with the Music City Modern Quilters. Wow, planning projects for that many days and trying to keep the piles separate occupied most of last week. My big project early in the week will be Smith Mountain Morning followed by getting borders on several UFOs. I will finally get back to Geese on the move at the MCMQ retreat. I mention all this to let loyal readers know that I will be in a "cell hole" much of the week and, if it's like last year, unable to connect to the internet. So guess who didn't think to move a car down to the bottom of our hill? Once the snow stopped (after 3 inches), my Main Man spent the afternoon blowing off the driveway and moved my car to the street. Hopefully we can get out to the grocery tomorrow for senior discount day. But we don't really have to go anywhere. It's the Queen Mother's sitters I worry about. When I heard that the guild I used to belong to (and still visit from time to time) is looking for bed-size quilts to replenish its charity quilt inventory, I decided to release a few tops, letting the guild take care of getting them quilted. Some already had backs and/or binding prepared. For several years I taught Spinning Rails, a design by Carol Britt at Sew What Fabrics & Batiks Etcetera in Wytheville, VA. This was a sample top to show a different fabric style and colorway from my quilted version. It's still one of my favorite quilt patterns -- so easy with several variations. Since I've reduced my teaching schedule, I felt I could part with this top. It would be easy to whip up another sample if the need arises. You will probably recognize this one as Bonnie Hunter's 2013 mystery, Easy Street. It was the first mystery I participated in, so I went by her colors. I just never fell in love with this one (polite translation, I despised it). Happy to get it out of my stack of tops TBQ (to be quilted). This pattern is Churn Dash from the book More Nickel Quilts. The fabrics had been cut for another Christmas quilt that I didn't care for after making one (of three), so I searched for something I could use the cut large squares in. (The first quilt from these fabrics went to the Washington, IL tornado recovery.) Churn Dash is one of my favorite blocks and I love the secondary pattern of ribbons running through the blocks when they are set together. Even though there are no obviously Christmas fabrics in this top, I didn't need another Christmasy quilt and knew this one would go to a good cause, eventually. These 9-patches used up some leftover strips. The gold toile fabric had been in my stash for a while, along with the coordinating gold solid. The pattern , Notable 9-Patch, was a free download from www.allpeoplequilt.com. However I simplified the pattern by making red/gold hourglass blocks to go between the 9-patches for a straight set instead of adding corners to the 9-patches and toile for a diagonal setting. With the exception of Spinning Rails, all these quilt tops were finished in 2015. I know the guild will find a home for these quilts and I feel a few pounds lighter! I know it seems like Smith Mountain Morning has gone on forever (after three years I guess you could say it has), but being my One Monthly Goal, I aim to stay focused. Sunday I stitched up three cornerstone blocks and one of the blue star blocks, just so I could show a different photo. I used one set of the shrunken star points to see if I still had enough seam allowance (I did) and how they would behave with further ironing (I used a lower heat setting). I think I'm going to go ahead and use the shrunken points; I made too many of them to consider remaking those units. This quilt won't be going to any shows! Today I will make the final two sizes of blue cornerstone logs and all the pieces/parts will be ready to assemble at the Nuts & Bolts Retreat next week. Heading out in a few minutes to deliver some charity quilt tops to my former guild. Linking up at Patchwork Times for Design Wall Monday. Let me first say I LOVE the One Monthly Goal (OMG). It is really helping me stay focused and motivating me to keep my OMG project moving along. I'm also motivated by the fact that the Rainbow Scrap Challenge (RSC) color for February is brown! ... and 80 brown star corners (and 48 blue ones). My solution to the scrappiness that I didn't like is to make scrappy pinwheel centers but keep the points and the corners consistent within a star block. Each block will have different fabrics, though. In contrast, the cornerstone blocks will have controlled centers and scrappy logs (mainly because I already had so many made). All the parts for the star blocks are finished and kitted up, ready to be sewn at the Nuts and Bolts Retreat week after next. Next week I will finish up the quarter-square centers and strip piece logs for the cornerstone blocks. I'm hoping it will be OK to include these units in the quilt. Any thoughts? Reporting in with Angela for ScrappyHappy Saturday. One Monthly Goal and then report at the end of the month. I started this quilt in a class with Bonnie Hunter at Mountain QuiltFest two or three years ago. My husband admired the picture in the book Scraps and Shirttails II: Continuing the Art of Quilting Green and when I asked him what attracted him he said "the colors," so I decided to go with Bonnie's scheme -- except she used old plaid shirts. If you follow me, you know I am not a scrappy quilter like Bonnie. But I was determined to take this opportunity to use up lots of blue and brown scraps as well as some muslin I inherited from my mother who died in 1979 (it still smells like her). I really believe the scrappiness is what made me not love this quilt; however, a recent conversation with another blogger has given me the inspiration to coordinate the scraps within each block. Now I'm back on track! A quest for a missing blue fabric related to the Rainbow Scrap Challenge (RSC) in January caused me to pull out this project. (Fabric wasn't there, by the way.) Rather than put cram everything back in the box I decided to at least get all the pieces for SMM cut and, in that way, I could re-shelve any unused fabric (one of my general yearly goals) and the cut pieces could become leaders/enders for other projects along the way. Well, imagine my joy when I discovered the RSC color for February is brown! So I can get credit for using brown scraps and accomplish a monthly goal at the same time!!! A week-long retreat later in the month should give me plenty of time to finish. But I need to finish cutting this week so SMM remains on my design wall for a second week. Learn more about One Monthly Goal here. Discover the Rainbow Scrap Challenge 2016 here. And hop over to Patchwork Times to see what other quilters are working on this week. Reporting in at Red Letter Quilts. Forgive me for taking a personal aside here, but my Disappointment may have been short-lived. Hope to fill in the details soon. Also, MIL continues to hang on.